Located in the foothills of the green, microclimatic foothills of the legendary Canigou mountain in the Pyrenees, between the ski resorts and the Mediterranean, in on the edge of Vernet-les-Bains (pop. 1500). It is known to have the best climate in France, with an average 300 days of sunshine per year, and it is rich on history, culture and natural beauty. In the past Vernet-les-Bains has been the favoured health resort of the British aristocracy, witnessed by the extravagant architecture of the casino and the parks. 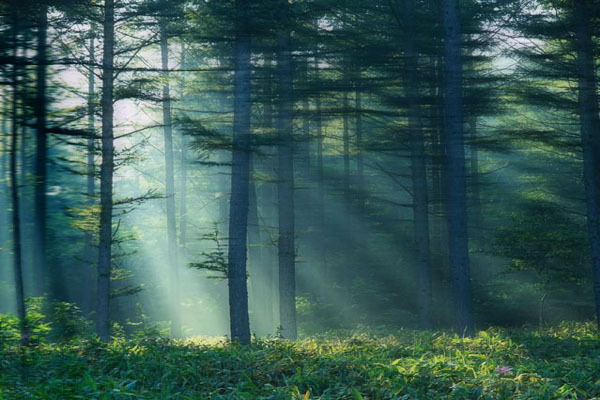 Europe’s largest wilderness area, the Pyrenees start just behind the village, with excellent opportunities for leisure activities, from hiking through mountain biking and fishing. A nearby waterfall has been named after the British - Cascades des Anglais. Famous Carcassonne, the tax free mini country Andorra, Spain and the Mediterranean beaches can be reached on day-trips. Our holiday village is situated 5 minutes walk from Vernet-les-Bains centre, which has all facilities - shops, restaurants and cafés, a sports centre, casino, thermal spa . The comprises one and two bedroom houses on two levels, containing lounge with wooden beams and fireplace, kitchen, bathroom and all are equipped with simple but robust furnishing. The architcture is medieval Catalan, but built as recent as 1970 - it took ten years to build - and partly refurbished in 1998-2005. Each house is different and half the houses are built in granite stone. Each house has a private terrace with spectacular, unobstructible views of Vernet Les Bains, the valleys and the mountains. Five of the houses also have a private patio (courtyard). 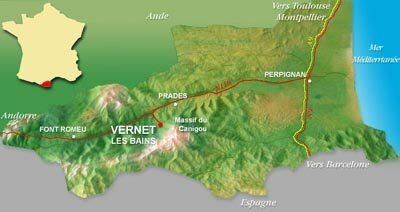 Vernet-les-Bains is located approx. 60 kms from Perpignan airport.